The unique Chem-Dry® Spot Remover™ is a highly effective and versatile carpet stain remover that can be used on carpets, upholstery, car interiors and upholstery fabrics. The non-toxic ingredients ensure the product lifts common household stains to the surface for effective removal. 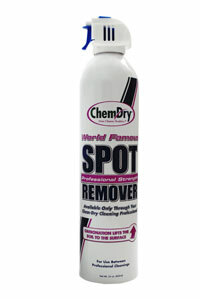 Spot Remover™ is available in 590ml cans. If you are interested in purchasing any of our Professional Home Care Products, please contact your local Chem-Dry representative.